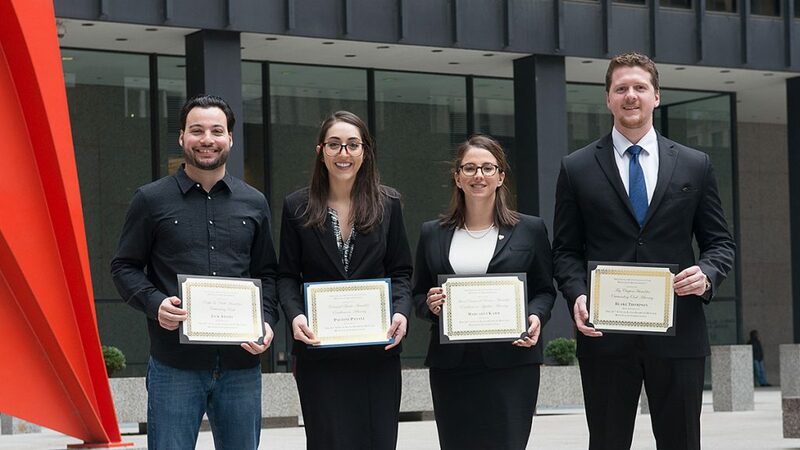 The annual Ilana Diamond Rovner Appellate Advocacy Competition is named for Chicago-Kent graduate Ilana Diamond Rovner, judge of the U.S. Court of Appeals for the Seventh Circuit. Students argued Carpenter v. United States, a case that presents a question about the scope of Fourth Amendment protection against unreasonable searches in the digital age. Learn more about the 2017 competition and the winners here. Students argued Masterpiece Cakeshop, Ltd. v. Colorado Civil Rights Commission, a First Amendment case out of Colorado. Learn more about the 2016 competition and the winners here. Students argued Evenwel v. Abbott, a closely watched voting rights case out of Texas that raises important issues under the Constitution’s Equal Protection Clause. Learn more about the 2015 competition and the winners here. Students argued Ohio v. Clark, a criminal case that raises issues under the Sixth Amendment’s Confrontation Clause. Learn more about the 2014 competition and the winners here. Students argued Woollard v. Gallagher, a Second Amendment case out of Maryland challenging that state’s so-called “may-issue” concealed carry law. Learn more about the 2013 competition and the winners here. Students argued a constitutional challenge to Section 3 of the Defense of Marriage Act (DOMA) which defines “marriage” as the legal union of one man and one woman. Learn more about the 2012 competition and the winners here. Students argued Thomas More Law Center v. Obama, one of several cases in the federal courts challenging the constitutionality of various provisions of the 2010 Patient Protection and Affordable Care Act. Learn more about the 2011 competition and the winners here. Students argued Schwarzenegger v. Entertainment Merchants Association, a case currently pending before the U.S. Supreme Court. Learn more about the 2010 competition and the winners here.